There are good days to start a social marketing campaign, and there are better ones: Most Facebook campaigns are deployed on Fridays, but those deployed on Tuesdays generate the most customer engagement, according to a study by Yesmail Interactive, which examines the customer engagement of campaigns conducted via popular social channels. The new findings are based on a three-month study of consumer engagement with online campaigns for 20 major retails brands, including Abercrombie & Fitch, The Gap, Ralph Lauren, American Eagle, J Crew, and Forever 21. 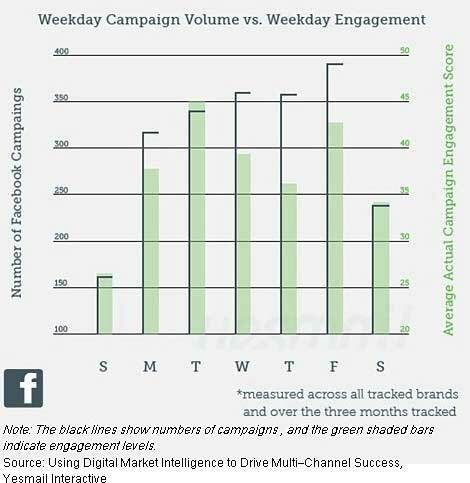 Among the Facebook campaigns studied, those deployed on Tuesdays earned the highest engagement, even though Tuesday ranked fourth in terms of the number campaigns conducted.